Peter Insull's Yacht Marketing and Ardell Yachts in Florida have announced that they have been appointed joint Central Agents for Longo Mai, a 35 metre (114ft) Cantiere di Pisa motor yacht. 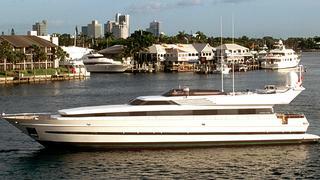 Longo Mai was contracted by Peter Insull's and built by one of Italy's oldest established family shipyards. She is now offered for sale for the first time since her delivery to her original owner. Longo Mai has never been chartered and has only ever been used privately by the owner and his guests. Accommodation is for a total of eight guests in four cabins. A large saloon, along with the added advantage of a separate dining room, complement the generous deck areas and make this a comfortable yacht with the added advantage of a cruising speed of 19 knots. Now offered for sale for the first time since new, Longo Mai is US duty paid, and lying in Florida. Her asking price is set at US$2,000,000.